Novelty motoring postcard from Brighton in the 1920s. Homepage. 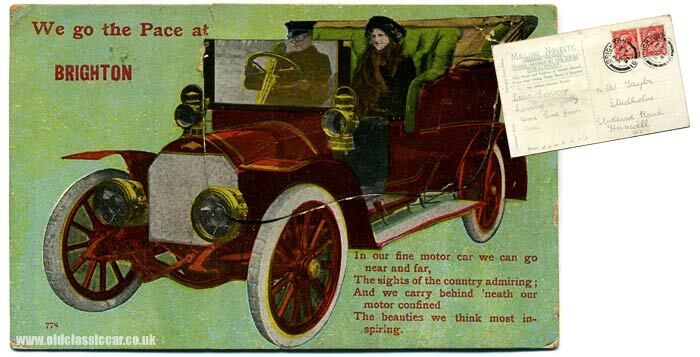 This page: A novelty automobile-related postcard postmarked in Brighton, July 1921. This 1920s postcard was produced as part of the "Valentine" series, a "Mailing Novelty", of a ".. shape passed by the GPO for 1/2d stamp". However for that you could only write the name and address of the sender (presumably in addition to the destination address) on the rear of the postcard, any more writing and you'd have to affix a further 1d (penny) stamp. The sender of this postcard, holidaying in Brighton, took no chances and affixed two one-penny stamps on it, just to be sure. The franking date is 29th July 1921. The postcard features a fine vintage motor-car, with both driver and passenger on board - "We go the Pace at BRIGHTON" it says. Perhaps these cards were produced for all the major towns and cities across the UK, with the location printed to suit? Both of the car's occupants are dressed in appropriate 1920's motoring clothing, ready for anything that the British seaside weather could throw at them while driving in their tourer. The beauties we think most inspiring.